Who doesn’t love a delicious, fast, one-pan, almost hands-off dinner when they get home from work? And bonus points if it reheats perfectly the next day. Even more points if it tastes just as awesome cold. 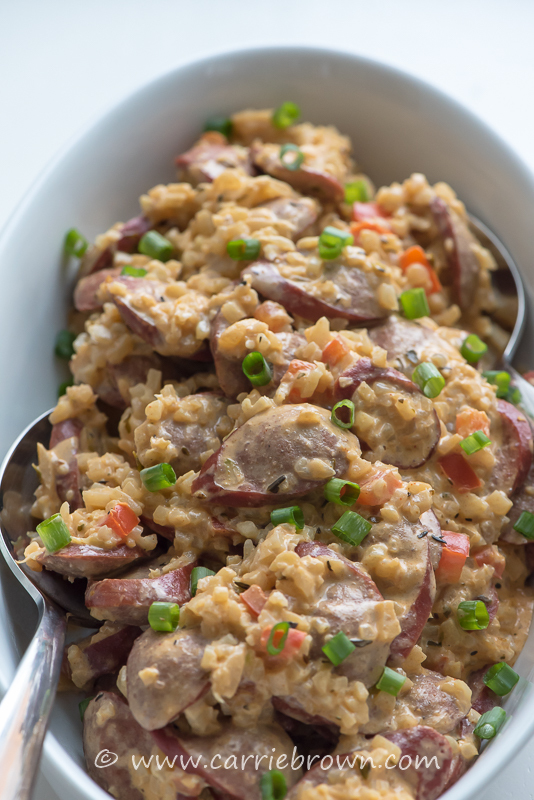 You get all the points with this dish of Creamy Cajun Sausage Skillet! I love a good sausage. And when they’re pre-cooked so all you need to do is warm them through, your scrumptious KETO life just got even easier. 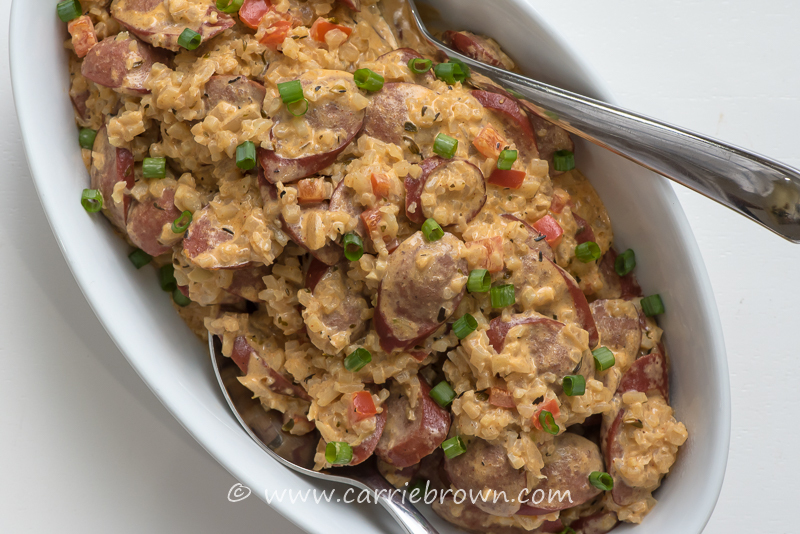 I like to use smoked sausage in this Creamy Cajun Sausage Skillet, but you can use any pre-cooked sausage you prefer. You can also use regular raw sausages and cook them up yourself ahead of time. It’s an extra step, but it won’t add much to the cooking time if you fry or grill the sausages while the veggies are busy simmering in the stock and spices. 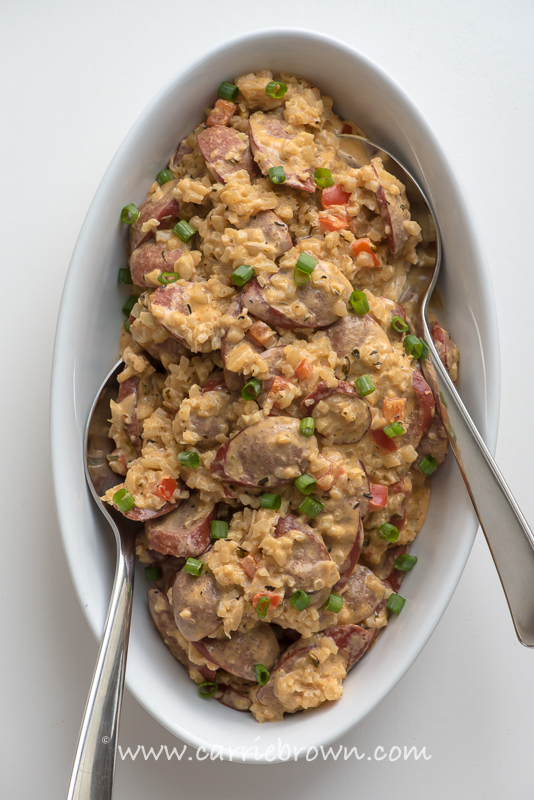 This Creamy Cajun Sausage Skillet is also a great dish to make a double batch of and freeze one for later use. Just defrost and warm gently and you’ll have a tasty meal ready in minutes. You can increase the protein if you need or want to by simply adding an additional 8 oz. / 225g – 1 lb. / 450g sausage. For more fat, add 2 oz. / 55g butter to the stock and spices. All the ingredients for this Creamy Cajun Sausage Skillet are likely already languishing in your kitchen – even the sausage if you keep a handy stock in your fridge for emergencies. Sausages are fantastic for this. My fridge is rarely sausage-less. They’re just so handy when you need to knock up a quick meal with whatever you have on hand. Heat the avocado or coconut oil in a pan over medium heat and sauté the onions for 5 minutes. Add the red pepper, riced cauliflower, chicken stock, salt and all the spices and herbs. Add the sliced cooked sausage and mix well. Add the cream cheese and stir until completely melted and everything is coated in melted cheese. Use green pepper instead of red pepper if they are more available or cheaper! Double the cayenne pepper if you prefer more of a kick to your dinner. If you have fresh oregano and / or thyme and prefer to use those, stir them into the pan with the cream cheese at the end. Use any cooked sausage you prefer. I love using this smoked sausage. 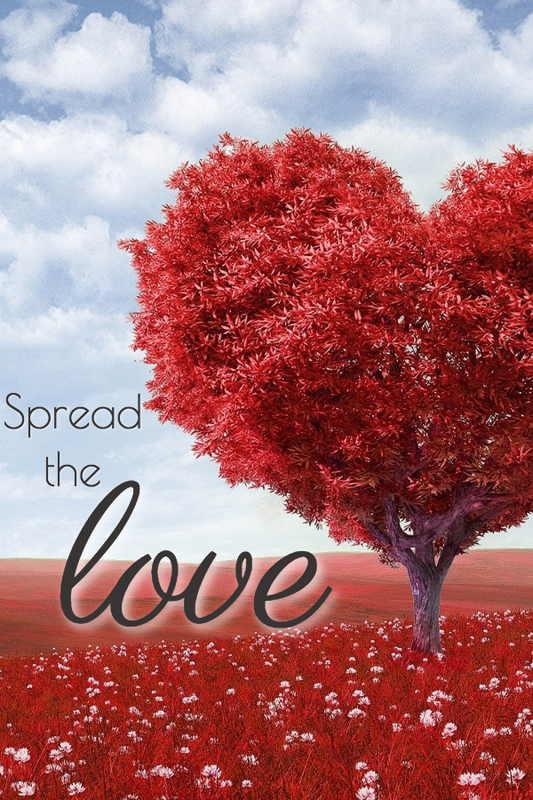 FOR DAIRY-FREE: leave out the cream cheese and add 1/2 cup / 4 fl oz. thick coconut milk. Then, gently sprinkle 1/2 tsp. konjac flour over the surface of the food while stirring rapidly with the other hand to incorporate it. Heat for another couple of minutes to let the mixture thicken.